iPhone Fax – Can I Get a Fax on My iPhone? Yes. 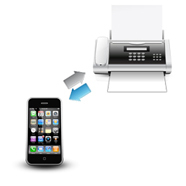 If you have an iPhone, iPad, iTouch or an other Apple device that you can access your email on then you also have a virtual fax machine with you! All you have to do is use an email fax service which will let you fax from your email and also from your iPhone. The best providers with cell phone fax apps for an iPhone are RingCentral and MyFax. After reviewing both, RingCentral has the best iPhone fax app. Which email fax service is right for you depends on how many fax pages you need to send/receive each month and what type of fax number you want or if you want to keep your current fax number. Let’s start with RingCentral Fax. This is an award winning service and an ideal solution for any business. Even if you have a small business, RingCentral makes your business look professional and well managed. The most basic plan includes 500 fax pages that you can use to send or receive. You can fax from iPhone with any RingCentral plan but you can get a complete fax and phone service that allows you to answer calls to your business number on your cell phone or VoIP office phones. RingCentral’s fax service is easy to use and you also get a free fax number when you sign up. You can choose a local fax number or a toll-free number. This service is available for US customers as well as for customers in the UK and Canada (RingCentral offers fax number for those international locations as well). RingCentral Fax is an ideal solution for individuals and businesses. Their plans start at just $9.99 a month for a monthly plan with 500 fax pages that you can send/receive. In addition RingCentral’s customer service was quick and clear to respond to any questions we had about the service and they have several ways to contact their customer service for help. MyFax offers a great and simple iPhone fax app and they are also the first to create a free Blackberry fax app. Unlike RingCentral, MyFax includes fewer pages in their basic plan, you can send 100 fax pages and receive 200 fax pages each month. The monthly cost is almost the same (RingCentral is $9.99 and MyFax is $10) the major difference between these two providers is not the quality of their service, but the fax numbers offered. MyFax offers fax numbers in over 40 countries! So if you are in search of an international fax number then MyFax is the best choice. This company is a reliable and secure choice, they already provide their service to well-known businesses such as FedEx, Sprint and Allstate to just name a few. With both service you can cancel at anytime, there are no contracts.